A French bulldog that went missing Tuesday has been found and returned to its owner, according to Shelby Township Police. The department wrote in a Facebook post that the Shelby community helped officers with tips. 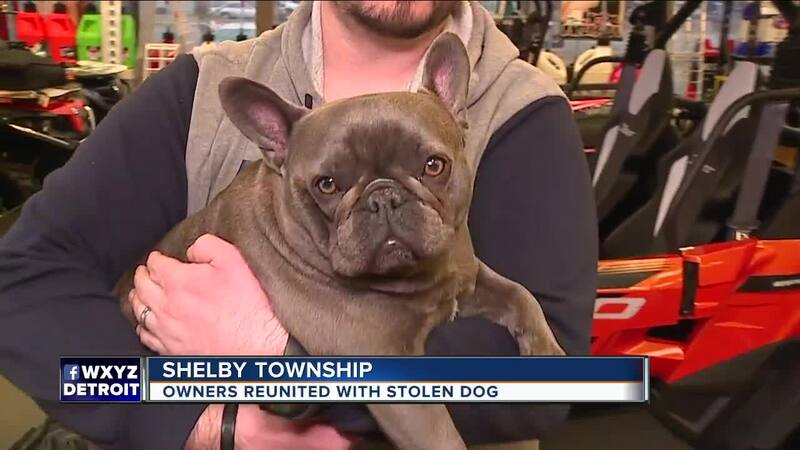 SHELBY TOWNSHIP, Mich. (WXYZ) — A French bulldog that went missing Tuesday has been found and returned to its owner, according to Shelby Township Police. The department wrote in a Facebook post that the Shelby community helped officers with tips. The workers at Magic Racing in Shelby Township were asking for help finding their French bulldog today after they say it was lured to a parking lot and stolen on Tuesday. According to a post on Facebook, Roxy, the shop's dog, was lured into a parking lot and taken. Roxy was outside sunbathing when it happened, and the shop is located on Van Dyke south of 23 Mile. Workers also say they are looking for a woman they believe is driving a gray Chevrolet 1500 pickup truck with wood pallets, who was seen leaving the lot about 7 minutes after Roxy was lured away.